A crisp, refreshing dessert for a hot summer day. In a mixer or food processor, combine whipped topping, goat cheese, lemon zest and vanilla. Combine until smooth and light. Reserve in refrigerator. In a large sauté pan, melt butter on medium heat. Add strawberries and sauté for 10 minutes or until they begin to break down. Add honey and sugar. Continue cooking for another 3-4 minutes. Remove from heat, refrigerate until completely cooled, approximately 30 minutes. When strawberry mixture has cooled, spread whipped topping evenly across watermelon slice. Place grapes in a ring around the outside of the slice creating a "crust." Scoop strawberry mixture into the middle of the ring and spread evenly. 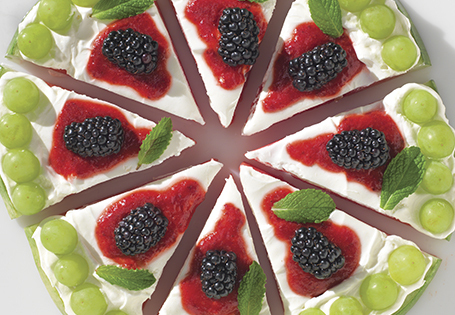 Top with blackberries and slice like a pizza.